You can't have a hero without an Arch Nemesis! Send your most heroic Crusaders to fight theirs all this weekend! The following Crusaders will get a buff this weekend starting from today until 12 pm PDT on Monday March 27th. Tags: crusaders, superhero, tier 2, new. The world is in peril again! It seems to happen every year now. It's time for the Crusaders to pull on the spandex, give their friends or family lame excuses for leaving them suddenly, and save the world. Super Hero Spring event runs from today through to April 3rd at Noon PDT. For those players who haven't unlocked them already, this is your chance to add both Bat Billionaire and Metal Soldierette to your roster. Of course, as this is a 2017 update of the original event you can also collect two new Crusaders: Arachnobuddy and Foresight. New Tier Two Crusader: Arachnobuddy. The first of the two new Tier 2 Crusaders is Arachnobuddy, a superhero imbued with superhuman spider-inspired powers. His alter ego teenager Paul Potter lives with his uncle Matt after a luchador savagely killed his aunt, Gwen. At level 50, his ability Web Blast shoots out a web projectile at a random enemy every five seconds dealing 200% of Global DPS. Collect equipment for Arachnobuddy to increase the number of webs he fires. At level 400, Arachnobuddy unlocks Stick Webbing where Web Blasts stuns affected targets for one second (but doesn't stack if multiple blasts hit the same target). New Tier Two Crusader: Foresight. Foresight is a new lifeform created by melding the power of an Unlimited Stone, one of the greatest sources of power in the Crusader universe, and an indestructible material called Reverbrium. At level 100, Foresight unlocks Playing Favorites, an ability that heals individual targets for 20% of max health per second. It heals humans if more humans are adjacent to Foresight than non-humans, or it will heal non-humans if more non-humans are adjacent to Foresight. In the end, if there are an equal number of humans and non-humans it doesn't heal anyone. At level 400 Foresight's Supernatural ability increases Supernatural Crusaders' DPS +50%. After you've completed the first new Tier Two objectives for Arachnobuddy and Foresight, there are three more objectives to conquer (after a few more drinks, naturally). New Tier Two Objective: The Revengers. 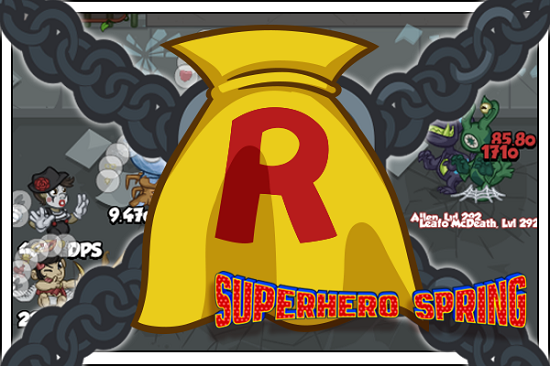 In The Revengers players can only choose Supernatural or Superhero Crusaders, plus Bush Whacker and Nate. Then they must reach area 400. New Tier Two Objective: Sidekicks. In the objective, Sidekicks three bumbling sidekicks take up slots in your formation, each with a unique debuff on adjacent Crusaders as they get in the way of our heroes with their misguided attempts to help (e.g. 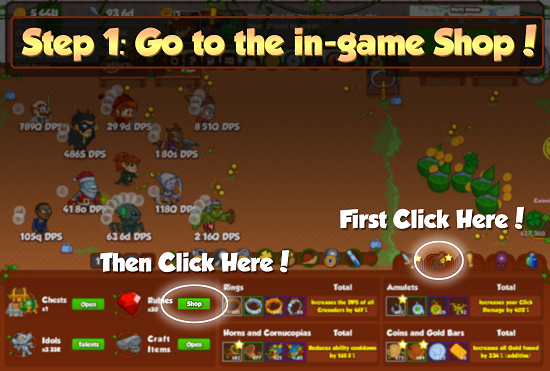 reduce DPS, reduce Gold Find, and disable formation abilities). New Tier Two Objective: Super Villains. The final new Tier Two objective is Super Villains. The Crusaders' arch nemeses spawn and attack the formation. Each super villain has different annoying abilities that'll make reaching area 500 a real challenge! 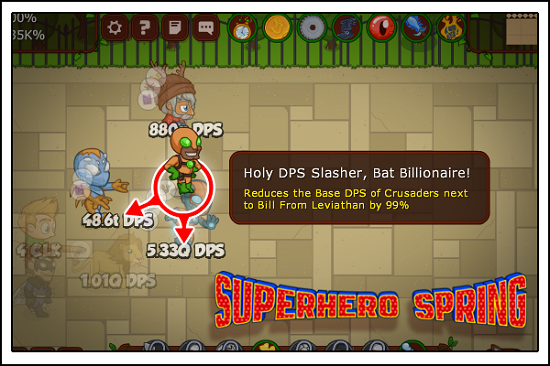 Equipment for both Tier 1 and 2 Crusaders can be found in Superhero Spring Jeweled Chests. However, gear for the Tier 2 Crusaders will only appear once you've unlocked the respective Crusader. You'll have until April 3rd at Noon PDT to complete the event. Cheers! Tags: new, weekend, buff, St, Patrick's, Weekend. After all the premature partying, it's finally St. Patrick's Day! Are you partied out, or can you last one more weekend? We're buffing all the green Crusaders! Woop Woop! The following Crusaders will get a buff this weekend starting from today until 12 pm PDT on Monday March 20th. Tags: bw2, changes, march, 2017. - Made progress on the next big content update. It’s on it’s way, just hang in there! - Issued out the free Amicus Compensation Pack (Thurs March 16th to Mon March 20th 12pm PDT), containing 20 Amicus Island Tokens, 2 Sandwiches, and a VIP Voucher. This was to compensate for various problems with Amicus Quests and some other things, due to server issues in the previous week. Tags: redeem, free, jeweled, chests, event. 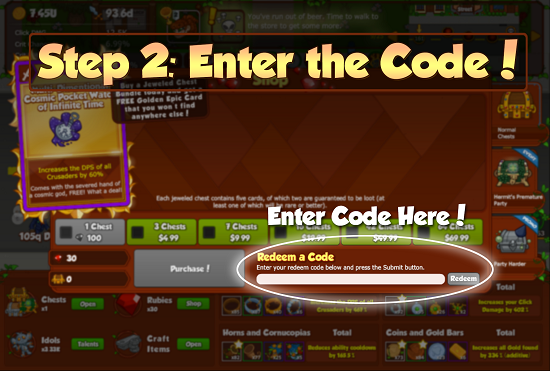 We've been giving away free jeweled chest codes to all players subscribed to the Idol Times newsletter for a while now. It's our long-standing tradition to give you a free event Jeweled Chest when we release a weekend buff. We also give you all free Jeweled Chests when we hit certain Facebook Likes or Twitter Followers milestones. If you didn't already know, all you need to do is sign-up for the newsletter here. Not only will you receive email updates about free jeweled chests, but you'll also receive the latest information about the game updates direct to your inbox. What's more, when you sign-up you'll be given a free piece of Rare gear. Step 1: Got to the Shop. If you play on mobile, you're going to need to link your account to a PC account. Check out this handy guide here. - Fixed various reported typos and quest descriptions. Which included, ironically, typos in the Proofreading Day texts. Keep the reports coming! Tags: new, weekend, buff, party, harder. It's time to start wearing buckets on your head and professing your love for vegetables! You just weren't partying hard enough before! The following Crusaders will get a buff this weekend starting from today until 12 pm PDT on Monday March 13th. Tags: weekend, buff, crafting, hangover. It has been a few days since Crafting was released... how are you feeling? Maybe drink some water... Take a nap... Then wake up and crush the weekend! The following Crusaders will get a buff this weekend starting from today until 12 pm PST on Monday March 6th.